Frozen Pizza Dough Recipe / Makes Excellent Flat Bread as Well. 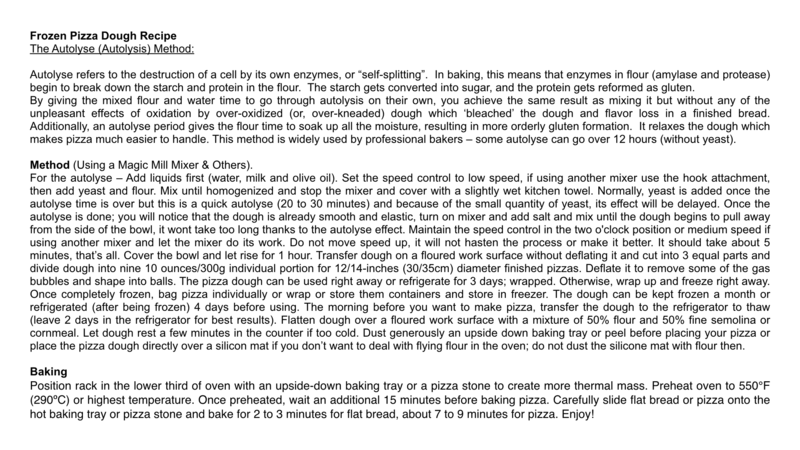 Makes 9 Pizzas (10 ounces/300g) – Recipe for 66% hydration pizza dough. Can be kneaded by hand. For professional bakers only: Desired Dough Temperature (DDT): 155ºF (68ºC). 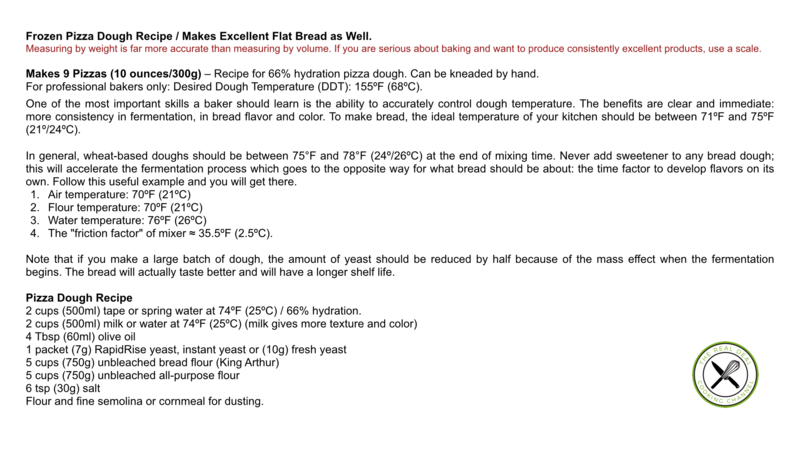 In general, wheat-based doughs should be between 75°F and 78°F (24º/26ºC) at the end of mixing time. Never add sweetener to any bread dough; this will accelerate the fermentation process which goes to the opposite way for what bread should be about: the time factor to develop flavors on its own. Follow this useful example and you will get there. The "friction factor" of mixer ≈ 35.5ºF (2.5ºC). Note that if you make a large batch of dough, the amount of yeast should be reduced by half because of the mass effect when the fermentation begins. The bread will actually taste better and will have a longer shelf life. 2 cups (500ml) tape or spring water at 74ºF (25ºC) / 66% hydration. Flour and fine semolina or cornmeal for dusting. Autolyse refers to the destruction of a cell by its own enzymes, or “self-splitting”. In baking, this means that enzymes in flour (amylase and protease) begin to break down the starch and protein in the flour. The starch gets converted into sugar, and the protein gets reformed as gluten. By giving the mixed flour and water time to go through autolysis on their own, you achieve the same result as mixing it but without any of the unpleasant effects of oxidation by over-oxidized (or, over-kneaded) dough which ‘bleached’ the dough and flavor loss in a finished bread. Additionally, an autolyse period gives the flour time to soak up all the moisture, resulting in more orderly gluten formation. It relaxes the dough which makes pizza much easier to handle. This method is widely used by professional bakers – some autolyse can go over 12 hours (without yeast). For the autolyse – Add liquids first (water, milk and olive oil). Set the speed control to low speed, if using another mixer use the hook attachment, then add yeast and flour. Mix until homogenized and stop the mixer and cover with a slightly wet kitchen towel. Normally, yeast is added once the autolyse time is over but this is a quick autolyse (20 to 30 minutes) and because of the small quantity of yeast, its effect will be delayed. Once the autolyse is done; you will notice that the dough is already smooth and elastic, turn on mixer and add salt and mix until the dough begins to pull away from the side of the bowl, it wont take too long thanks to the autolyse effect. Maintain the speed control in the two o'clock position or medium speed if using another mixer and let the mixer do its work. Do not move speed up, it will not hasten the process or make it better. It should take about 5 minutes, that’s all. Cover the bowl and let rise for 1 hour. Transfer dough on a floured work surface without deflating it and cut into 3 equal parts and divide dough into nine 10 ounces/300g individual portion for 12/14-inches (30/35cm) diameter finished pizzas. Deflate it to remove some of the gas bubbles and shape into balls. The pizza dough can be used right away or refrigerate for 3 days; wrapped. Otherwise, wrap up and freeze right away. Once completely frozen, bag pizza individually or wrap or store them containers and store in freezer. The dough can be kept frozen a month or refrigerated (after being frozen) 4 days before using. The morning before you want to make pizza, transfer the dough to the refrigerator to thaw (leave 2 days in the refrigerator for best results). Flatten dough over a floured work surface with a mixture of 50% flour and 50% fine semolina or cornmeal. Let dough rest a few minutes in the counter if too cold. Dust generously an upside down baking tray or peel before placing your pizza or place the pizza dough directly over a silicon mat if you don’t want to deal with flying flour in the oven; do not dust the silicone mat with flour then. Position rack in the lower third of oven with an upside-down baking tray or a pizza stone to create more thermal mass. 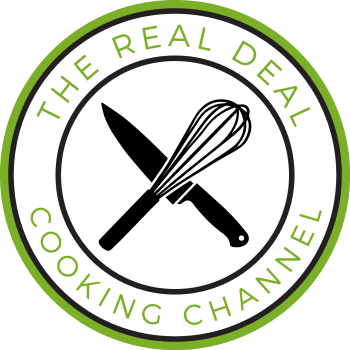 Preheat oven to 550°F (290ºC) or highest temperature. Once preheated, wait an additional 15 minutes before baking pizza. Carefully slide flat bread or pizza onto the hot baking tray or pizza stone and bake for 2 to 3 minutes for flat bread, about 7 to 9 minutes for pizza. Enjoy!